Our stylists are fully trained in all types of men’s grooming whether that’s a simple short back and sides or something more creative. We take care to provide a bespoke hair cut using the latest techniques and only use high quality male grooming products. Our stylists offer far more than traditional men’s hairdressing and love a challenge. If you’re looking for a modern, forward thinking hair salon then look no further than Bibas Hair & Beauty. Speak to our team about any wet or dry cut, styling, colouring or the latest trends. A top quality gent’s hair style is essential to make the right impression. We’ll be happy to work with hair of all types and styles and make sure you leave looking your best! The ideal service for a quick refresh and tidy up. If you’d like something a little different our stylists are on hand to offer advice on a new look or the latest trends. We’d be happy to listen to your ideas and are able to create you an alternative style. There’s been a huge increase in men colouring their hair and we’d be delighted to talk through some options. For a gentlemen looking to achieve an evenly cut beard and sharp looking facial hair. An unkept beard is doing you few favours, ensure you’re looking your best. For further details please contact us or you can request an appointment online. 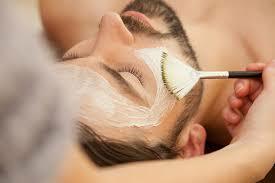 Our men's beauty treatments include facials, waxing, body exfoiliating and conditioning treatments. Full body waxing including brazilians, hollywood and intimiate waxing treatments. We use both hot and strip wax for the best results. We have a range of manicures and pedicure services to suit every occasion from express right up to super deluxe treatments. Book an appointment with us today and be guaranteed a worthwhile experience.